Dermarolling / Microneedling / Re: Can I make Vitamin C serum out of tablets? This question is off-topic because it's not a support question about our products. Pinpoint bleeding as you described (or even more) is completely normal and even tiny bruises are OK. You should not be getting big, serious bruises. Single needling is much more intensive and targeted than dermarolling and the redness after single needling can last for days. Some residual redness can even last for weeks. It is all OK.
Dermarolling / Microneedling / Re: Can Leaving A Layer of Blood After Stamping Affect Healing? Yes, exactly, that is why it is better to remove most of the blood before it dries into major scabs. There is principally no problem leaving blood on, except the problem with scabs. Applying oils after microneedling is a good idea because oils prevent evaporation of water from the skin thus they are excellent moisturizers. However, acne prone individuals must be careful concerning the face because oils may break them out. Vit. C and A are not completely necessary but they help establishing ideal conditions in the skin for collagen production. Dermarolling can both improve Melasma and make it worse, this is individual. Melasma is caused by uneven production/distribution of skin pigment melanin. Melanin pigment is normally present in the skin and more is produced upon sun exposure. Melanin is our natural UV filter. The darker the skin the more we are protected from UV damage. However, if melanin is unequally distributed /produced in the skin you get hyperpigmentation. It is not known why the skin unevenly overproduces melanin in melasma and that is why you cannot address the cause, only the consequences. It is often connected to excessive sun exposure in the past and melasma suffers must protect themselves from the sun as much as they can. BTW, melanin is also present in the iris of the eyes. Blue eyes have a layer of melanin in the back layer of the iris. Brown eyes have a layer of melanin in the back and also in the front layer of the iris and they are better protected from the UV. Albinism is the disorder of having no or almost no melanin. In some unfortunate individuals (common in melasma suffers) skin sometimes produces more melanin as a reaction to other stimuli than the sun. The stimuli can be hormonal, mechanical - having massage, being exposed to very hot or very cold temperatures, being exposed to strong wind, having any kind of skin procedure (acid peel, laser treatment, dermarolling, applying irritating skin products etc.). The same procedure can help or worsen melasma, depending on how you individually react to it. Acid peel can diminish melasma or the irritation from the peel will trigger more melanin production. It is the same with other methods. Any kind of irritation of the skin can potentially trigger melanin production in melasma suffers. There is no other way to know how you will react than trying it repeatedly on a small test patch. Many melasma suffers use a dermaroller to enhance penetration of hydroquinone cream (hydroquinone prevents melanin formation and you should try it) with great results but we also have a forum posting from a person saying she thinks her melasma got darker after rolling. First do a test patch with the dermastamp, if everything OK, stamp the wrinkles around your eyes and lips for several months. If everything OK, you can slowly start with dermarolling your entire face. It is the same with our skin products. Both Tretinoin and vit. C (ascorbic acid) helped melasma in medical studies (you can find the link to the studies on our forum) but they are irritating to the skin and thus they can potentially also make melasma worse. Hydroquinone (we do not sell it) has its issues as well. You can try a 0.5 mm regular dermaroller (up to three times a week) to enhance the penetration of a Hydroquinone cream. The best protocol is 3 month on, 1 month off and so on. Skin Needling to Enhance Depigmenting Serum Penetration in the Treatment of Melasma G. Fabbrocini, 1 ,* V. De Vita, 1 N. Fardella, 1 F. Pastore, 1 M. C. Annunziata, 1 M. C. Mauriello, 1 A. Monfrecola, 1 and N. Cameli. Copyright © 2011 G. Fabbrocini et al. Many thanks, Granger, for posting. It shows what I have been always saying. Scars are a very difficult problem to solve and various approaches/methods, a little improvisation and lots of patience are often necessary to achieve results with "stubborn" scars. There is no one single approach that will always work with all people. >The vit c powder should this be applied after each 1.5 roll every 3 weeks or should I be applying it daily after/inbetween rolling. >If I was to us the 0.5 stamp alongside the 1.5 for lines on my forehead and laugh lines is it ok to be using the 0.5 every couple of days or so then the 1.5 every 3rd week? 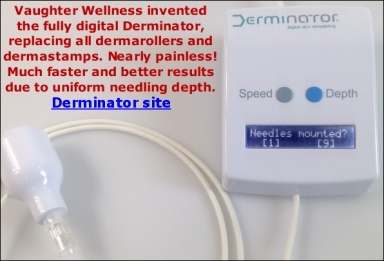 Buy a 1.5 mm dermastamp with 35 needles and needle your scar very densely every three weeks. Stamp also the edges of the scar to soften the scar tissue and blend it more with the surrounding skin. Right after the treatment and until it heals, apply a little of our Infadolan ointment. I suggest buying a 1 mm dermastamp (not a dermaroller) and trying it for many months on one small area of the skin to see whether the thermal damage will improve and how the skin reacts to it. I am certainly not against lasers. The problem with any method (a method that actually works) is that a few will get wonderful results, many will get good results, many will get no results and a few will get disastrous results. face due to diminished fat and the original method was more or less abandoned. I will answer your other questions later. Sorry - I meant by dishwashing detergent that green liquid you use to do the dishes with, manually. I do not think there is any problem with leaving the pinpoint bleeding on the skin until the next day. If you take a shower where the dried blood kind of dissolves and slowly washes off, it is OK but do not forcibly remove dry scabs from the skin. Scabs must be left until they are "ripe" and fall off by themselves. Never pick off a scab, if you remove it prematurely, it can leave a scar. Keep the treated area very much moisturized. You can leave the pinpoint bleeding on the skin but apply for example a little of almond oil or a little of our Infadolan ointment (if you are acne prone, apply something that you know does not break you out) on the skin when you are done with your stamping session. There is no problem leaving the blood on the skin but the treated area should not get dried out, no matter if you leave the blood on or not. You can do it both ways. For those who have lots of stretch marks, it is better to first roll the entire area and when the redness is gone (a few days later) and you can clearly see the stretch marks, start stamping them. Those who have just a few stretch marks can stamp and roll in the same session. Then it is better to first stamp and then roll because the entire area will get red from rolling so if you first roll, you will not be able to target the stretch marks precisely with a dermastamp. Your choice of microneedling instruments - a combination of a dermaroller and a more targeted instrument (such as a dermastmp) is very good. Just to make sure "dermastamp 8 times" means to stamp 8 times each part of the stretch mark or to go over the same stretch mark 8 times. It is laborious.